MANILA, Philippines – Everyone should strive to help new generations of Filipinos understand why the martial law era should never happen again, Macalañang said on Sunday, September 20. In an interview over state-run radio dZRB, Communications Secretary Herminio Coloma Jr. said that there are now almost two generations of Filipinos who have no recollection of what happened under the Marcos dictatorship. “Kaya dapat lamang na maunawaan nila ito at maging kaisa nila tayo doon sa pagsasabing ‘never again’ o hindi na dapat maulit ang malagim na karanasan ng bansang Pilipinas sa ilalim ng martial law (It is best that they understand and we should help them understand why we say never again to what the Philippines experienced during martial law),” he said. Coloma added that together with ensuring sustainable long-term growth, progress, and stability, lessons from the past should be conveyed to the youth. “it is important to impart to the youth of our land the lessons learned from martial rule and the struggle to restore democracy, as our continuing legacy to all future generations of Filipinos,” Coloma said. 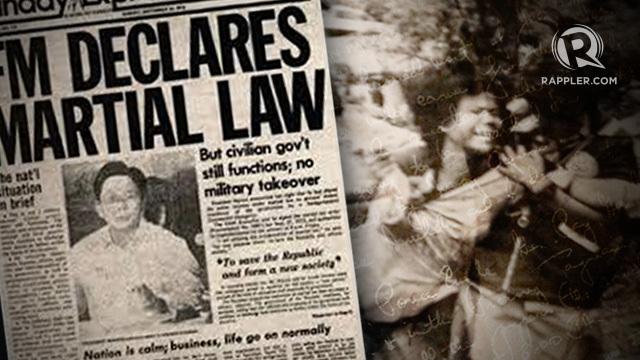 On September 21, Monday, it will be 43 years since the late President Ferdinand Marcos imposed martial law through Proclamation No. 1081. Coloma said the Palace joins the country in remembering and honoring the sacrifices of the victims of martial law “which is probably one of the darkest chapters” in history. “With courage, they defied harassment, cruel punishment and fear as they asserted and fought for the recognition of basic human rights at a time when the dictatorship demolished the house of democracy in our land,” he said. The reinstalled democracy paved way for free expression – including freedom of the press – which the Philippines should be proud of. “Malinaw at klarong-klaro sa atin at sa kahit sinong observer na ang kalayaan sa pamamahayag sa Pilipinas ay isang magandang halimbawa kung paano ito dapat igalang at ipatupad sa isang demokrasya (It is very clear that freedom of the press in the Philippines is a good example of how we should respect and implement democracy),” he said.